BEN SCHILLER ... Ben Schiller is a staff writer for Co.Exist, and also contributes to the FT, and Yale e360. A new project from Louisville is creating detailed maps of everything good and bad in a down-and-out neighborhood to discover exactly what the problems are and figure out how to make them better. It’s a cliche of management that if you don’t measure something, you can’t manage it. But it’s true. And it applies as much to communities as it does to multinational corporations. The video above is from a community action group in Louisville, Kentucky, called the Network Center for Community Change. The Network has been mapping neighborhoods to identify vacant lots, houses that need renovation, and more stable pieces of property. By doing so, it says the community can make decisions that better reflect local conditions, and needs. Vacant lots, which drag down the appearance of an area, and lead to crime and health issues, are a problem all over the country, especially since the foreclosure crisis. Mapping, though, is an increasingly popular way of strategizing about local problems, with major 'opportunity mapping' projects now underway in several cities. The Network started the Louisville initiative in November 2010 because it realized the official statistics about vacant properties were often inaccurate. 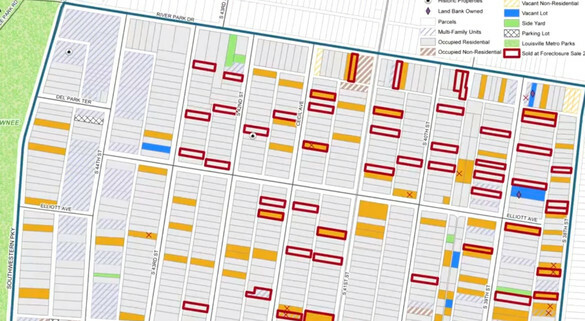 'The Metropolitan government tracks vacants at about 7,000 properties. What we’ve learned in the last 18 months is that they are off 26-30%, in both directions. Sometimes they way undercount it. Sometimes the vacants have been reoccupied,' says Jane Walsh, who heads the mapping project. The group has tracked 3,600 properties so far, with plans to look at 3,600 more by the end of this year.